Edited April 27, 2013 - for an updated version of this Royal Icing Recipe, please visit my other blog, Amy's Confectionery Adventures! When I shared my photos from my St. Patrick’s Day Cookies, I promised a photo tutorial, as I had been decorating at midnight when the lighting was less than ideal. So when I set out to make Easter cookies (because you can’t have a holiday in this house with out cookies!) I had planned on making a lovely tutorial again. Well, it wasn’t midnight when I made these cookies, it was 2am! Oops! It is so much easier for me to decorate when the kids are down and I am a little pokey! 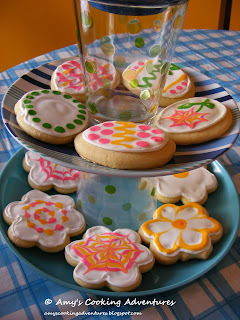 So instead, I am sharing the royal icing recipe I used and a couple websites I have found with some much nicer photo tutorials than I was able to make in the wee hours of the morning. I used a simple sugar cookie as a base, but royal icing will complement pretty much any kind of rolled cookie. Be warned it takes a few tries to get the hang of royal icing, but that just means that there are more “quality control” cookies…wink, wink! Enjoy! Combine the meringue power, powdered sugar, & 4 tablespoons water in the bowl of an electric mixer. Beat for 7-10 minutes on low or until the icing forms peaks. Note: If using a hand mixer, set it to high and beat for 10-12 minutes. Transfer a small amount of royal icing to a piping bag fitted with a small round tip (I used a 3). Place the remaining icing into sealed containers so it does not dry out. 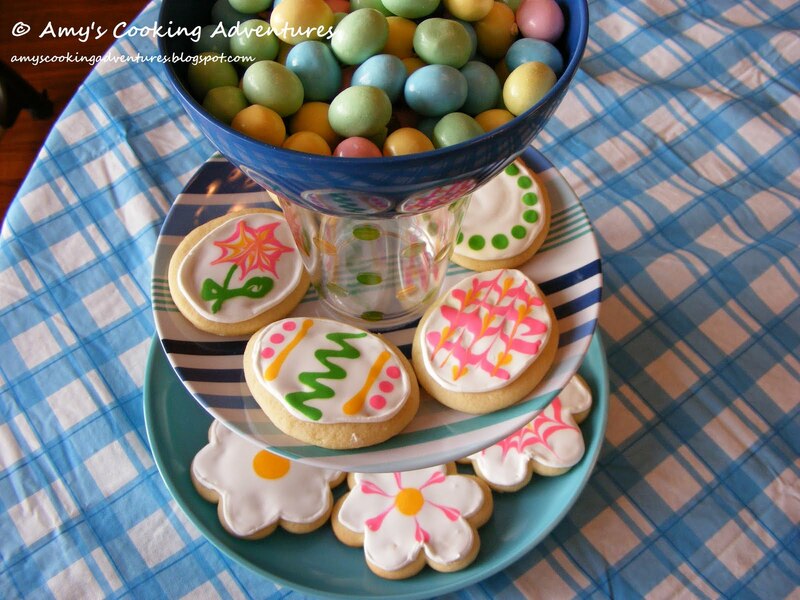 Carefully pipe the outline of each cookie. 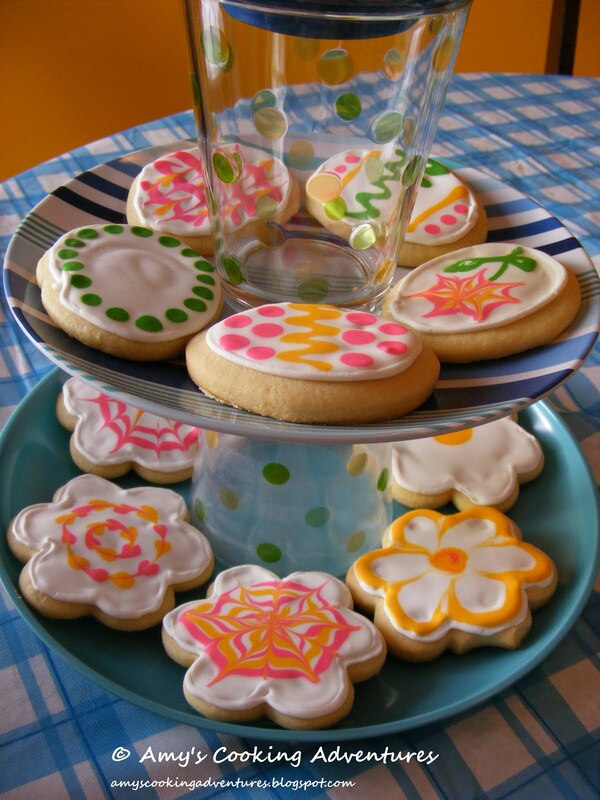 Using gel coloring, tint the remaining royal icing to the desired colors. Then begin adding water to the icing, 1 teaspoon at a time to thin. The icing will be properly thinned when the icing runs off the back of the spoon and is reabsorbed in 10 seconds. Let the thinned icing rest, covered, for 10 minutes to let any bubbles come to the surface. Very gently, stir the icing to remove the bubble and transfer the icing to squeeze bottles. You can find these at craft stores. Or I bought the yellow & red condiment holders at Wal-mart for $1.50! Squeeze out enough icing to flood each cookie (inside the outlines), use an angled spatula to get into any curves or corners. Decorate as desired.